Oil on canvas: 25 1/4 x 19 in. 64 x 48.2 cm. The hitherto elusive artistic personality of Alberto Carlieri has recently been focused by the researches of Dr.David Marshall, who has rescued the artist from the early shadow of Panini and built a corpus of related works that distinguish him from contemporary practioners of the architectural vedute such Domenico Roberti, Alessandro Salucci and Giovanni Ghisolfi. Studies of Carlieri by such eminent historians as Frederico Arisi, Luigi Salerno and Frederico Zeri have tended to confuse his capricci with several of these painters, and in particular Panini, to whom Carlieri’s works have often been attributed. The facts of Carlieri’s life are limited: we know that he studied under the architectural painter Giuseppe de Marchis and with the master of the baroque quadratura Andrea Pozzo during the 1690’s. After that his style settles into a fairly consistent series of colonnades enlivened by dancing figures, playful amorini and vistas through to sunlit shores with ports or castles. The architectural detail is crisp and carefully studied, focusing on the Esztergom column motif, a projecting entablature supported by a Doric, Ionic, Corinthian or Composite column. Giant urns and friezes are rendered in accurate detail, but Carlieri’s vedute never descend into archaic pedantry because he always included a celebratory narrative of animated staffage, sometimes featuring Bacchus mounted on a goat, or a group of dancing maidens playing pipes and cymbals, an echo of Poussin’s ‘Dance to the Music of Time’. These figure groupings are most fully resolved in a pair of pictures in the Musee des Beaux-Arts, Angers: The Triumph of the Infant Bacchus and Sacrifice to Bacchus with Pan and Maenads. 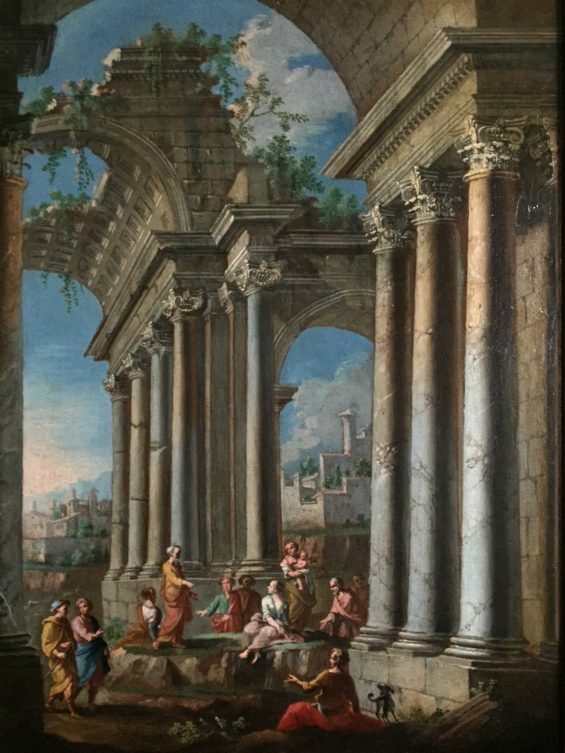 The quality of Carlieri’s work declined in his later years, but his career marks an important link between the architectural genre of the Codazzi and the triumphant classicism of Panini. I am writing to enquire about "Elegant Figures resting in the Colonnade of a ruined Palace, a view through to a fortified coast beyond"